A strong early season, rock-solid reservation numbers and a very timely snowstorm looming in the forecast could add up to record business at Vermont ski areas over the Martin Luther King holiday weekend. Meteorologists are predicting that up to 20-plus inches of fresh snow could hit the Green Mountains over the weekend, with timing seemingly tailor-made for ski areas: Late enough to not adversely impact travel, but right on time to deliver ideal powder conditions for holiday guests. Skiers and snowboarders eager to plunder all that powder are snapping up available reservation spots, putting ski areas in an ideal position for the crucial second leg of the ski industry’s “Triple Crown” – Christmas Break, MLK Weekend and Presidents’ Week. This snowstorm would be just the latest in a string of good fortune for Vermont’s ski areas this season. Record November snowfall resulted in the deepest early-season snowpack in the more than half a century that records have been kept for Mount Mansfield, the state’s highest peak. December saw sustained cold temperatures ideal for snowmaking, allowing ski areas to stockpile man-made snow and open the majority of their terrain for skiing and riding. Business over the Christmas holiday break was strong. Bromley Mountain, for example, reported a 20-percent increase in revenue and 10-percent spike in visitation over last year’s Christmas numbers. Mountain Top Inn and Resort was 100-percent booked for two weeks straight around Christmas and New Year’s, and Mount Snow Resort on Dec. 30 saw its largest number of skier and rider visits in a season that had already broken such records numerous times – and is expected to do so again over the MLK holiday. “We anticipate reaching our highest visitation number of the year this weekend, with the combo of the holiday and hopefully an epic powder day,” said Kelsey King, interactive marketing manager at Mount Snow. Another big-time delivery of snow from Mother Nature last week was the proverbial icing on the cake, allowing ski areas to drop enough ropes to reach an open-terrain rate across the state of more than 80 percent - compared to just over 50 percent at the same time last season. Most alpine resorts in Vermont expect to offer 90- to 100-percent open terrain by Sunday. 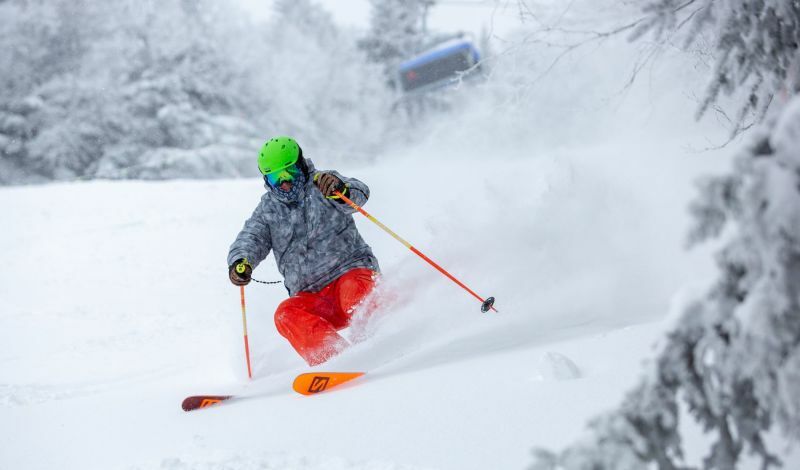 “On the heels of our two-foot snowstorm from last week, the arrival of this storm could make for the best MLK snow conditions in recent memory,” said Courtney DiFiore, communications manager at Killington Resort. This holiday is important for the ski industry because it’s a springboard to further boost skier and rider enthusiasm heading into the heart of the winter season. “MLK is critical,” Chait said. “It’s that period that keeps skiing fresh in people’s minds and solidifies that January is a great time to be out on the mountain.